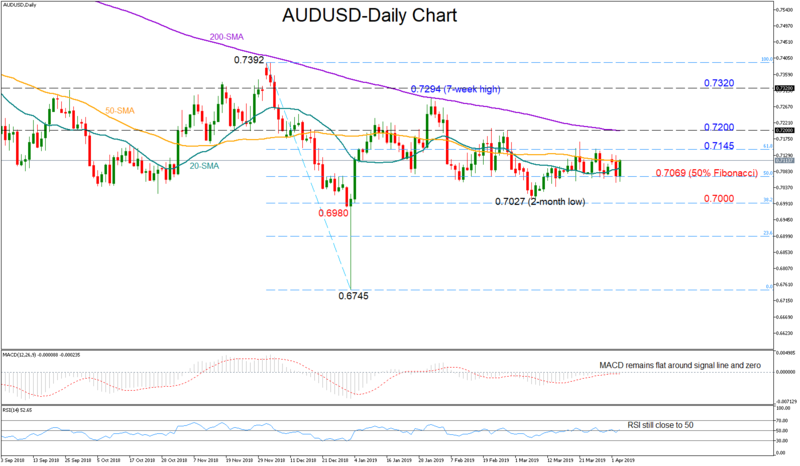 AUDUSD had an impressive start early on Wednesday, fully recovering the losses it made on Tuesday, but the technical indicators suggest a continuation of the recent neutral situation in the short term as the MACD has yet to enter positive territory and show strength above its red signal line. The RSI has pierced its 50 neutral mark once again, however with the indicator holding close to this threshold, significant gains are less likely to occur. Further upside may initially retest the 61.8% Fibonacci of 0.7145 of the downleg from 0.7392 to 0.6745 before the 200-day moving average currently near 0.7200 comes into view. Breaking this line, the focus will shift straight to the 0.7294-0.7320 area where the price found strong support and resistance in previous sessions. Still, only a rally above the 0.7392 top would switch the neutral condition in the medium-term picture into a bullish one. In brief, AUDUSD is holding a neutral bias in short-term, while in the medium-term picture, the pair is in a sideways move within the 0.7392-0.7000 territory.